Here come the planes, roaring through the afternoon sky! Beryl Markham leads the pack in her familiar Vera Gull. They turn wide toward the ocean, and now the old veteran Charles Lindbergh maneuvers ahead of the young aviatrix in a dazzling display of aerial virtuosity, and soon the Spirit of St. Louis is flying comfortably ahead of the competition. The race seems all but over. 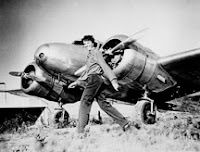 Suddenly, Amelia Earnhardt in her #3 Lockheed Electra bursts from a nearby cloud bank! Wasting no time, the plane rushes furiously into the pack, its twin Pratt & Whitney engines screaming with 900 horsepower. The other planes fall away as the brash young pilot known as "The Intimidator" mercilessly bumps and nudges her way forward. And then there is only the Spirit of St. Louis, and the Electra is soon menacing its rudder. Lindbergh stares into his rear-view mirror, and his heart grows cold with fear as he beholds his great nemesis, her big, dark sunglasses and huge, bristly moustache instantly recognizable despite the dirt and scratches shrouding her cockpit window. This is the face of grizzled, unrelenting determination. This is a face Lindbergh has seen all too often, a face that damn well means business. And as Earnhardt zooms past him, Lindbergh is sure that the eyes behind those sunglasses are fixing him with a cold and lethal gaze. He is left bobbing in the Electra's wake, watching the sun flash off its silver skin like some fantastic aquatic creature, hurtling through cerulean seas. As Earnhardt steers toward the finish line, the other planes recede into the distance, and finally she relaxes her grip on the yoke, the whiteness of her knuckles slowly ebbing. Her teeth unclench, and she breaths in deep, icy-cold lungfuls of air. Moments later she takes the checkered flag, and rewards herself with a well-deserved plug of chewing tobacco. Love her or loath her, Amelia Earnhardt is a winner once again.